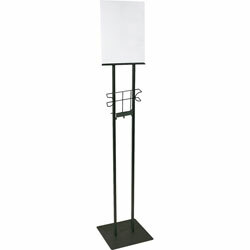 Lobby sign holder stand includes a sign holder and one literature pocket. Crystal acrylic sign holder opens for easy insertion of literature up to 11" wide x 14-1/2" high to mount vertically or horizontally. Literature pocket allows you to offer pamphlets and other information to passersby. Another pocket (sold separately) can be added to display information on both sides. Attaching any literature pocket is optional. To attach, simply use easy-insert mounting holes. Literature pocket and frame are made of heavy-duty steel with a powder-coat finish and 30 percent recycled content. Lobby stand includes a "Take one" label. Black Sign Holders from Buddy Products! 60 In Stock today.